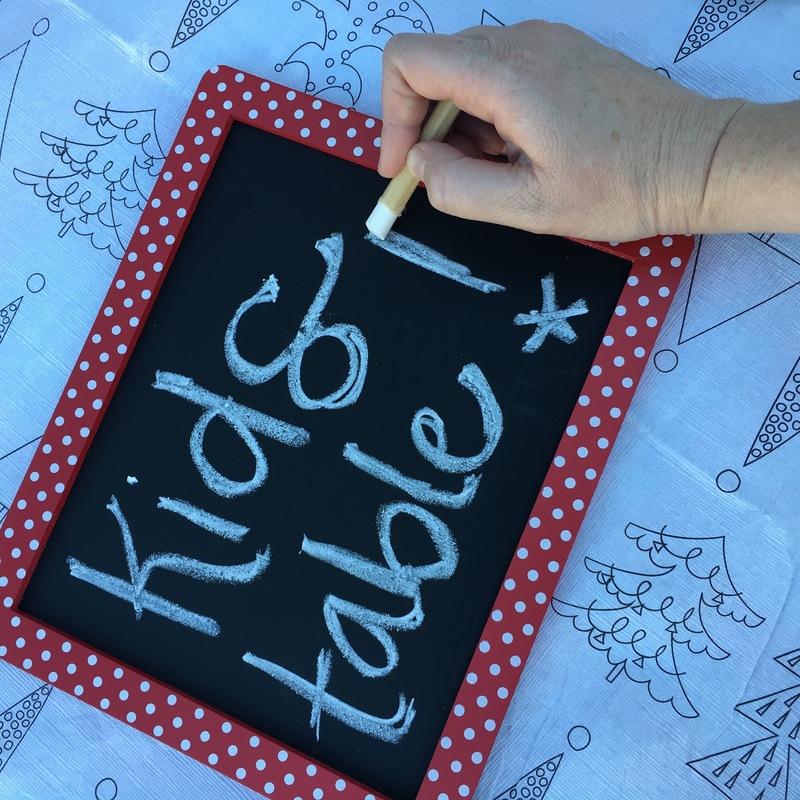 I have created a sample adult and kids table to show you just how easy it can be to make your table look fantastic, while keeping everything disposable and easy on the clean up. Simple little touches can go a long way and make your table special! My Christmas theme this year is red and gold with touches of plaid and snowflakes. 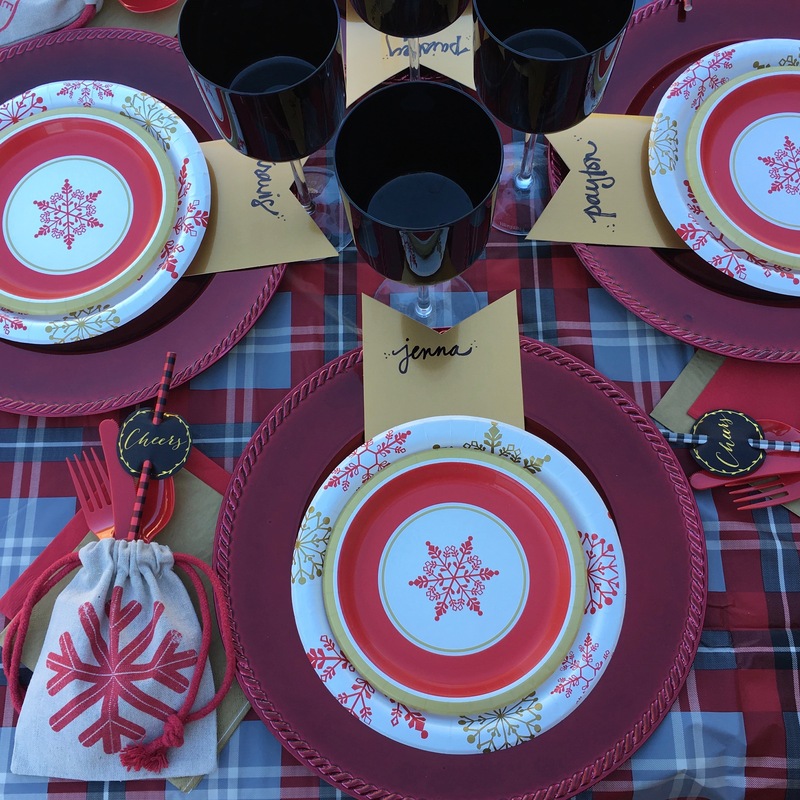 I love how red and gold look together during the holidays and a timeless print like plaid and a few creative snowflakes make for a great textured look. 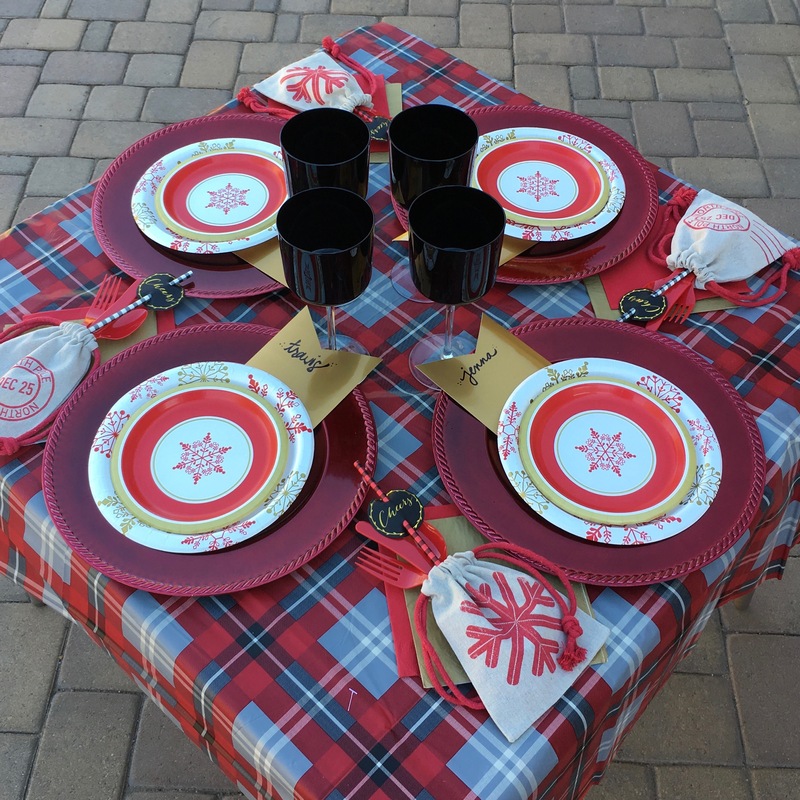 These are a few of the items I found to create this simple and easy to clean table setting. 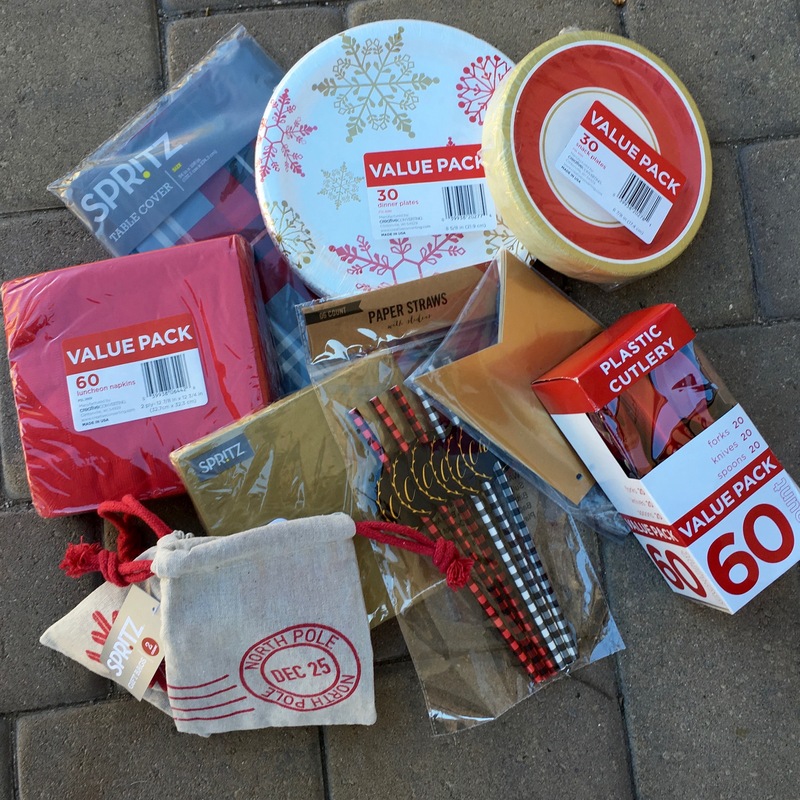 I purchased all of these items at Target in either the $1 bin or in the holiday section. Target has fantastic deals right now and so many patterns and colors to choose from, so be sure to check out your options while supplies last! 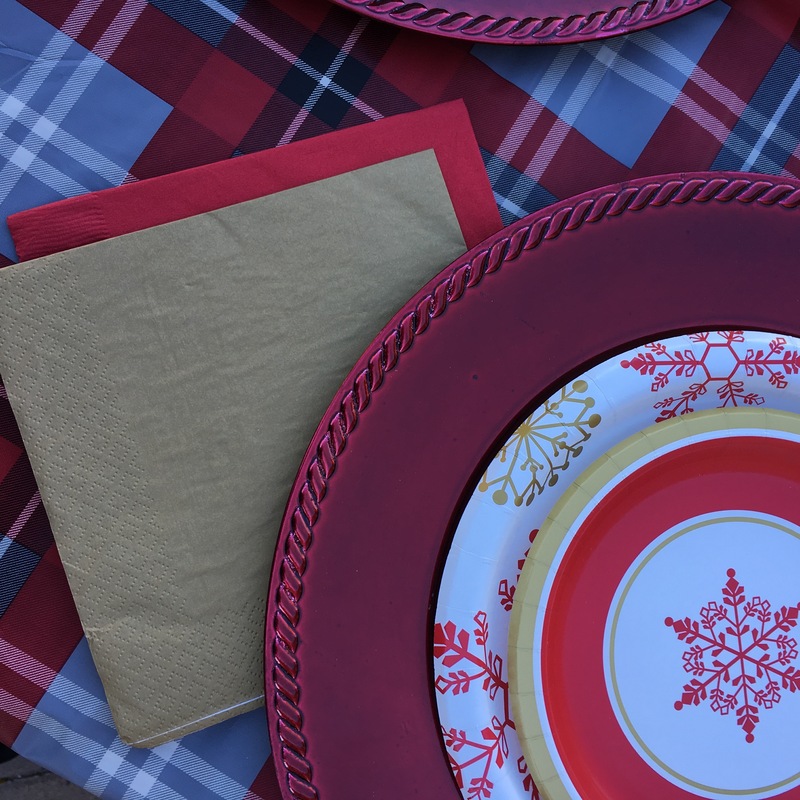 I started with a plaid throw-away plastic tablecloth as the base to provide the perfect festive touch to the table. Did I mention it can be swooped up after use and thrown away! No washing machine needed! The next best thing to remember is that layering is your friend. 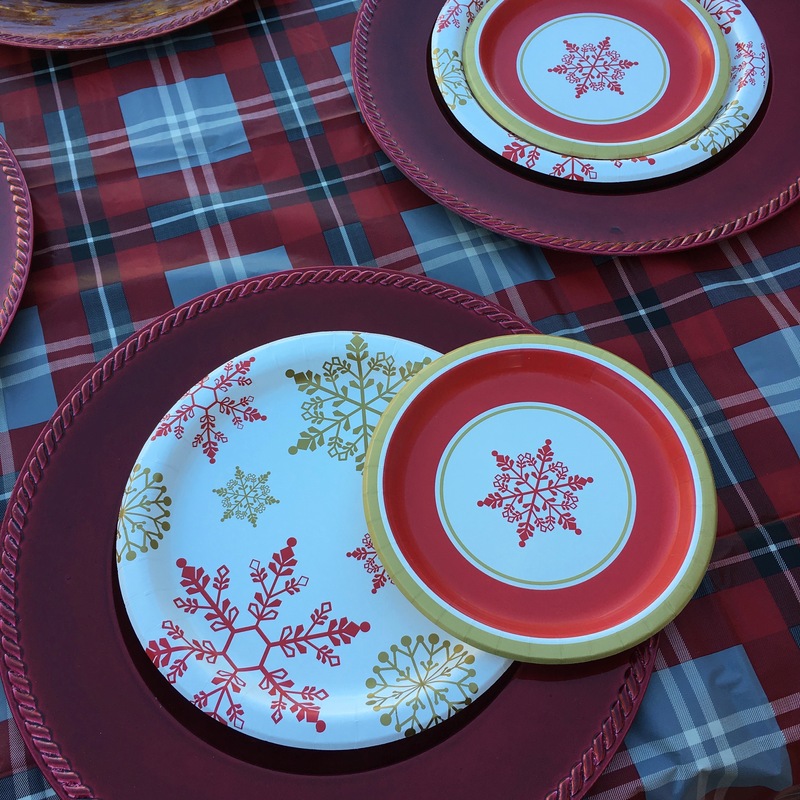 I found a large and small plate with complimenting snowflake patterns and layered them onto red chargers that I already own. (I bought my plastic chargers for $2 each at a craft store, they are great and inexpensive pieces to always have on hand.) I also love layering napkins. Below I have both a gold and a red large sized napkin layered together. They are the same size, but I just offset them to allow each color to stand out. Besides adding a cute touch, having two napkins is practical too… at least in my home with my meals! Don’t be afraid to get creative and have fun with the silverware. 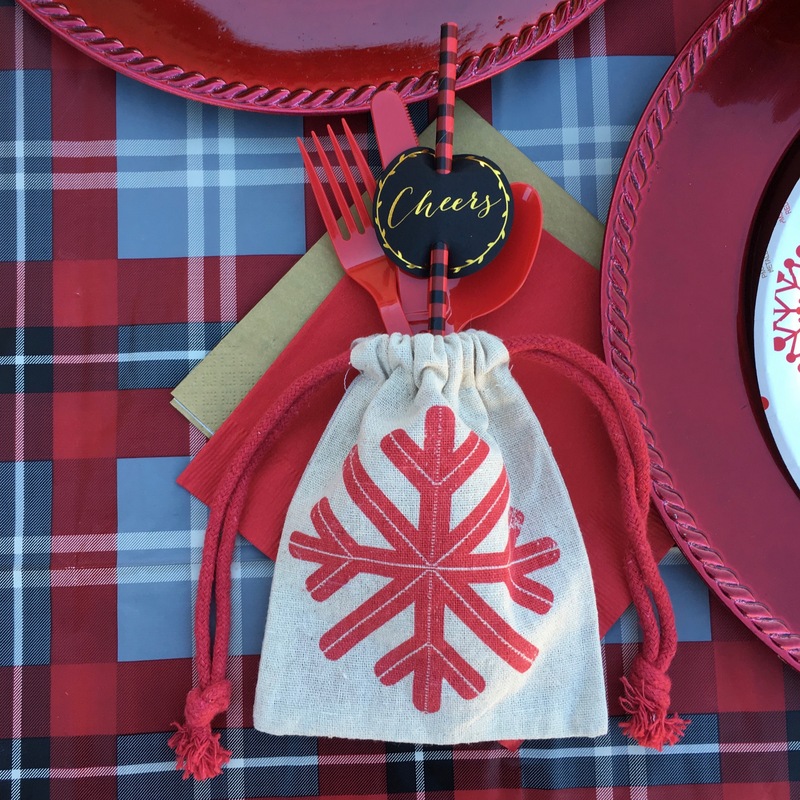 I bought a red set of silverware and a festive straw and placed them in a mini-burlap pouch. The snowflake pouch reminded me of Santa’s bag of toys from all of the children books. 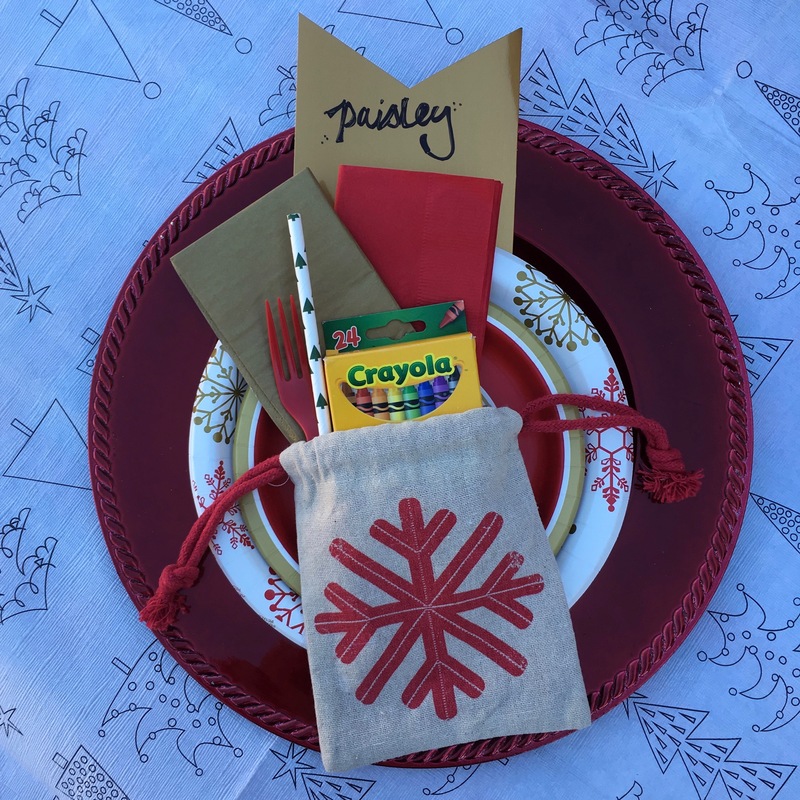 You can either give the pouch away as a little favor to your guests at the end of the meal or save them to reuse again next year. 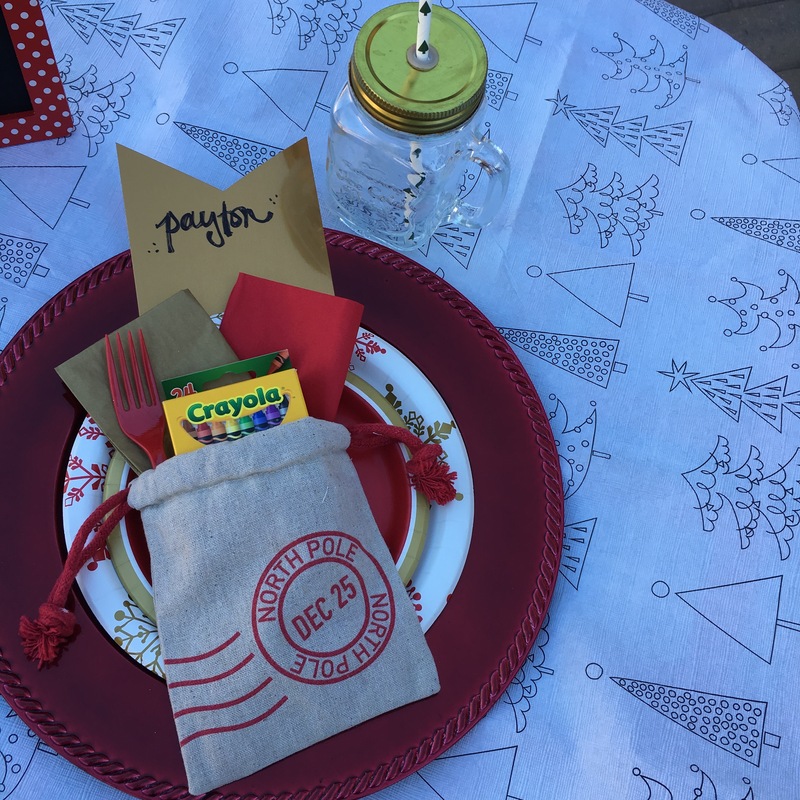 If you are having trouble finding the little burlap bags, another cute idea would be to have a mini stocking hold the silverware. Adorable! To add a personalized touch, buy an inexpensive bunting banner set and write each guests name on a piece that you can tuck below the plates. 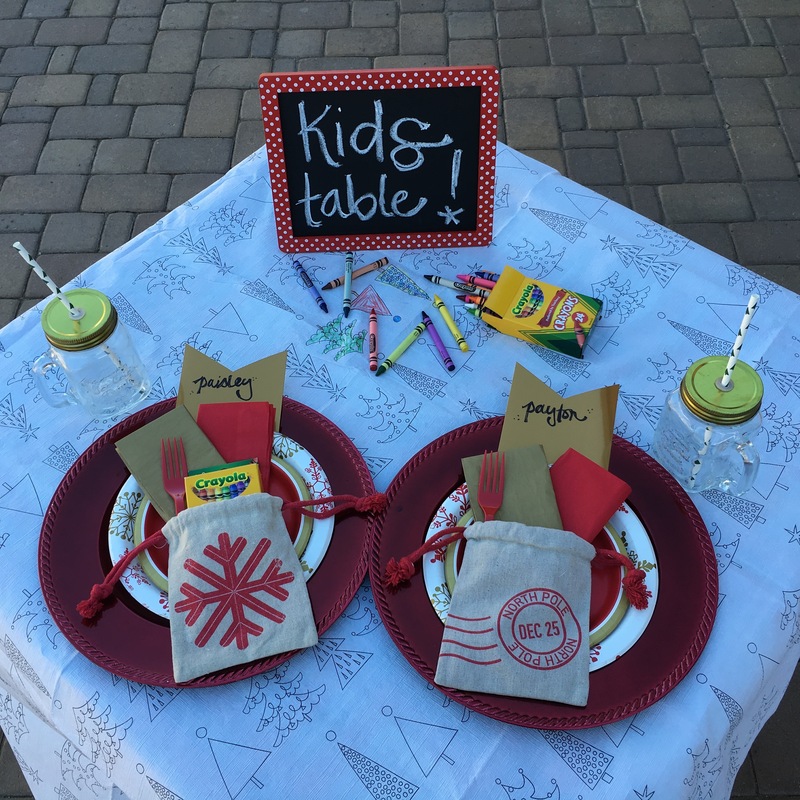 This doubles as a cute way to assign seats and add another creative touch to the table. I got this great idea from my very creative friend Whitney, who used this touch at a party I went to earlier this season. 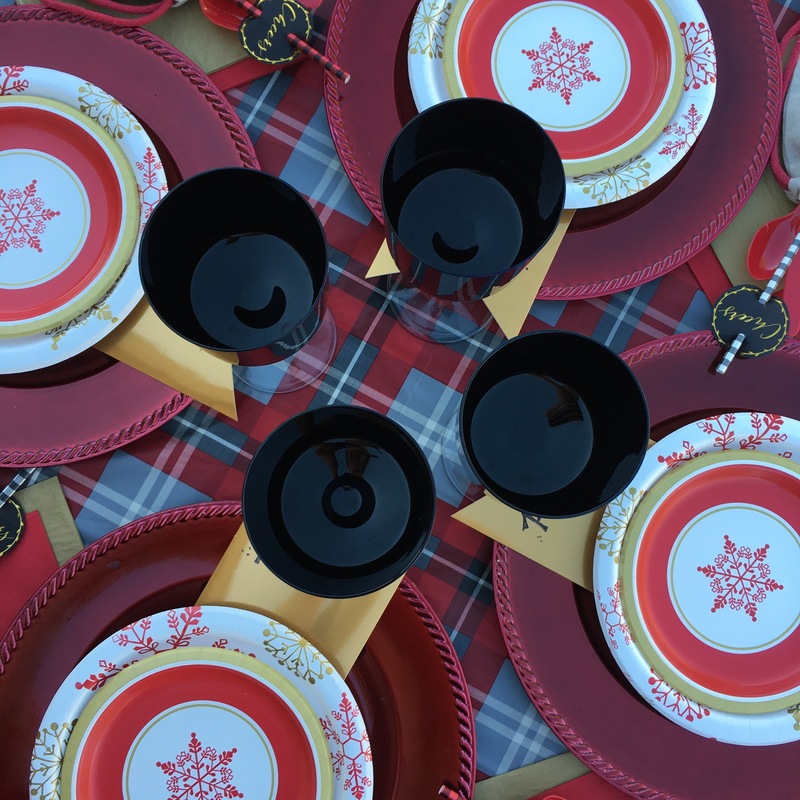 It truly is the perfect way to add a simple seating assignment to each individual place-setting! And last but not least, the glassware. Since this is the adult table I added some beautiful black goblets that I already own, to finish off this special holiday look. Feel free to use any glassware that you already own or purchase a set of plastic or paper cups to also throw away at the end. I decided to forgo a centerpiece and use the glassware as just that. Sometimes a centerpiece can take up too much space and end up interfering with the meal. So, instead of spending more money or making something from scratch, I utilized all of the patterns and colors already on the table to make the table look full enough without one. *A simple candle or mini-votives are always a great inexpensive centerpiece option. I am so pleased with the final product and I know it will be so nice to just wash the glasses and wipe down the chargers at the end of the meal. And in the end it doesn’t feel like I had to compromise beauty or quality for ease of clean up. Win-Win! For the kiddie table, I kept it simple but enjoyable. Here are the items I purchased to create a fun place for the little ones to eat. Once again I found all of the items at Target in the holiday section or in the $1 bin. For the base I purchased a Christmas themed color-on tablecloth (these tablecloths are the best, I also used one for our Thanksgiving kiddie table! Click HERE to see that post). 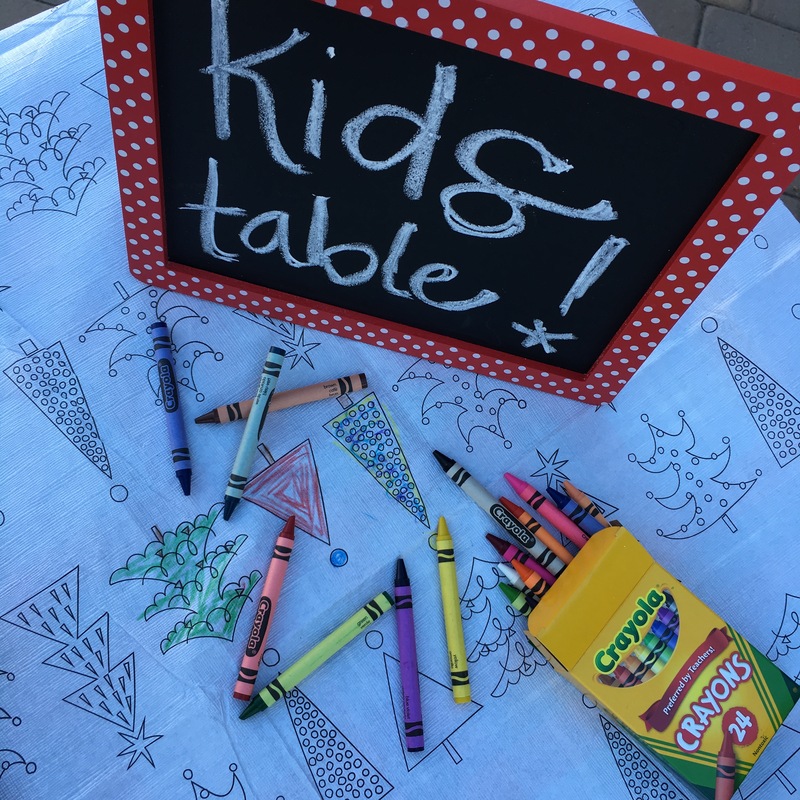 I also thought it would be fun to add a simple chalk board to the table to help the little ones find their area and allow them another item to play with after their meal. Since I purchased value packs of the plates, napkins and silverware I had enough to use of those same items at the kiddie table as well. I also had enough of the bunting banner pieces to create seat assignments and I bought a few extra burlap bags to use at the kids table too. 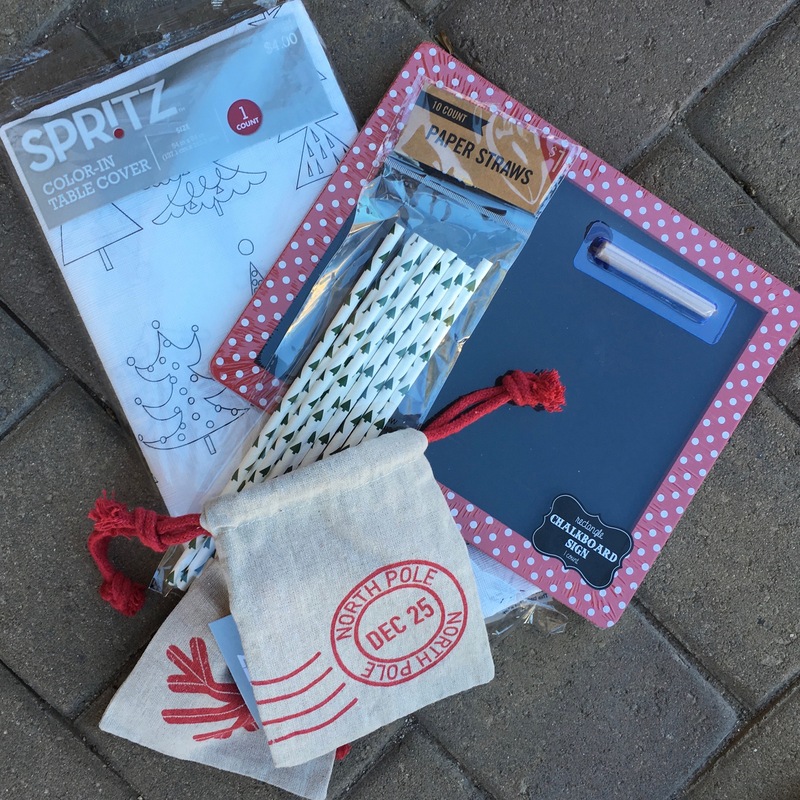 The kids will love filling the burlap pouches up with little goodies throughout the day. 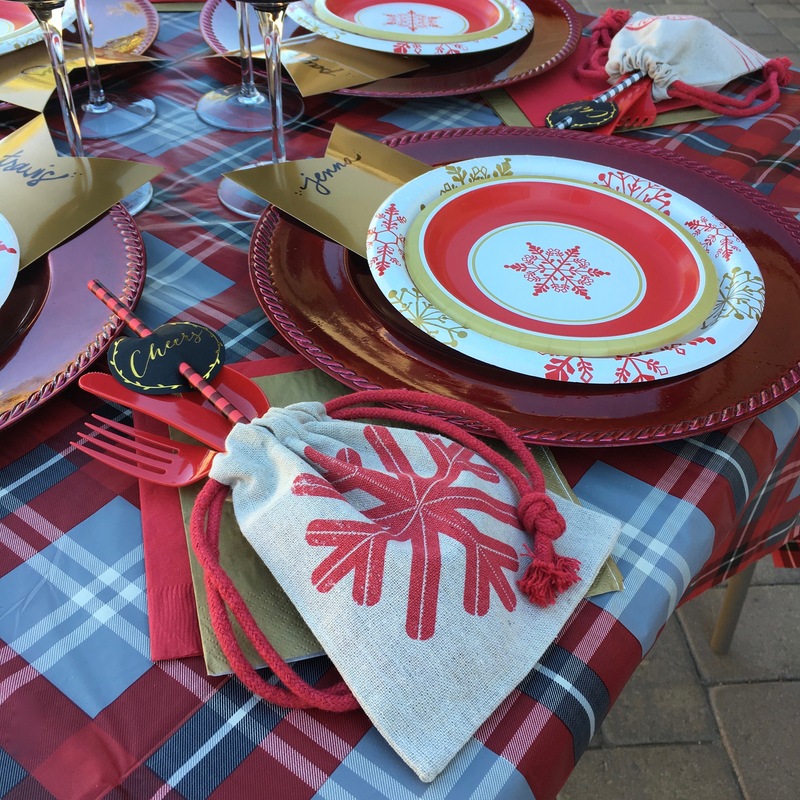 The only few changes I made for the kids table was placing the layered napkins inside the pouches with the silverware and I found a Christmas tree straw that I figured the kids would enjoy. My favorite aspect of the kiddie table is the individual boxes of crayons. 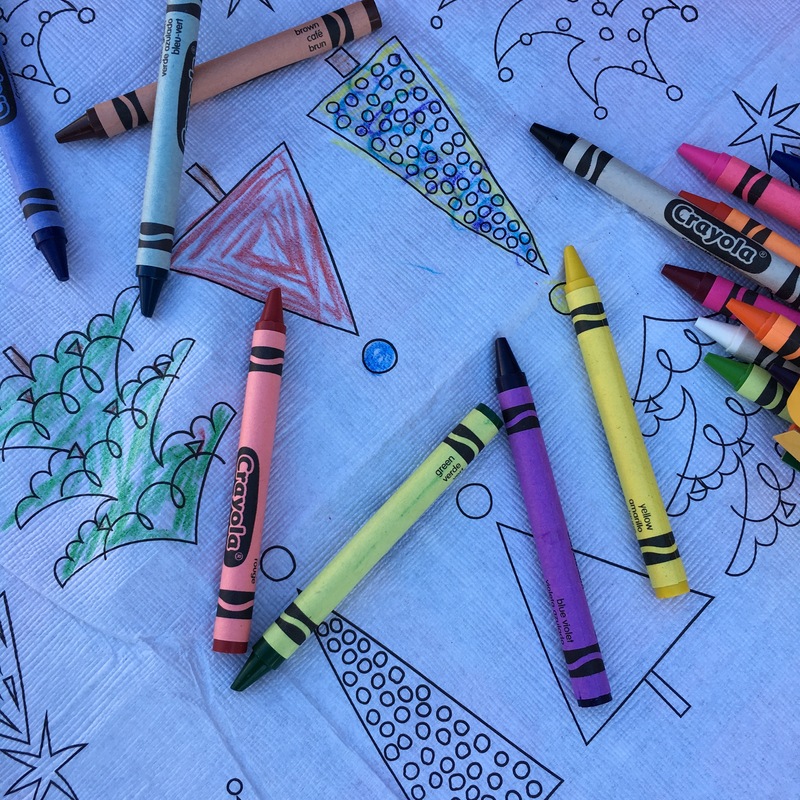 You can place a box of crayons in each childs burlap bag as a gift and the perfect item for them to color the tablecloth with. This is an inexpensive and adorable touch that will entertain the little ones and allow the adults to enjoy their time as well! 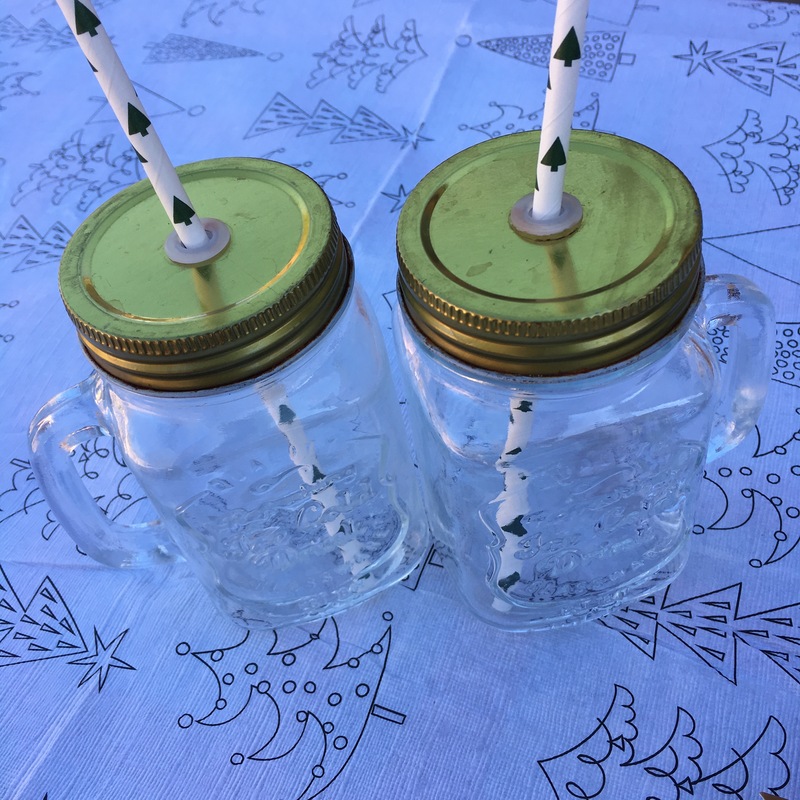 Of course you are not going to want the children to drink out of goblets, so I pulled out our glass mason jars with lids. The kids can enjoy their favorite beverage sipping on their Christmas tree straws. I find that the mason jars with a handle and lid are very kid-friendly and also add a festive touch. Depending on your kids ages, if you don’t trust your little ones with mason jars you can always resort to a holiday themed sippy cup. There are plenty of cute and inexpensive options at Target. I love how fun, festive and kid friendly this table is. It’s all in the little touches and isn’t it great to know you only have to wash the drink-ware! Mommas – Let’s get away from the piles of dirty dishes this year and get back to what is important at Christmas, the birth of Christ and fellowship with our loved ones. 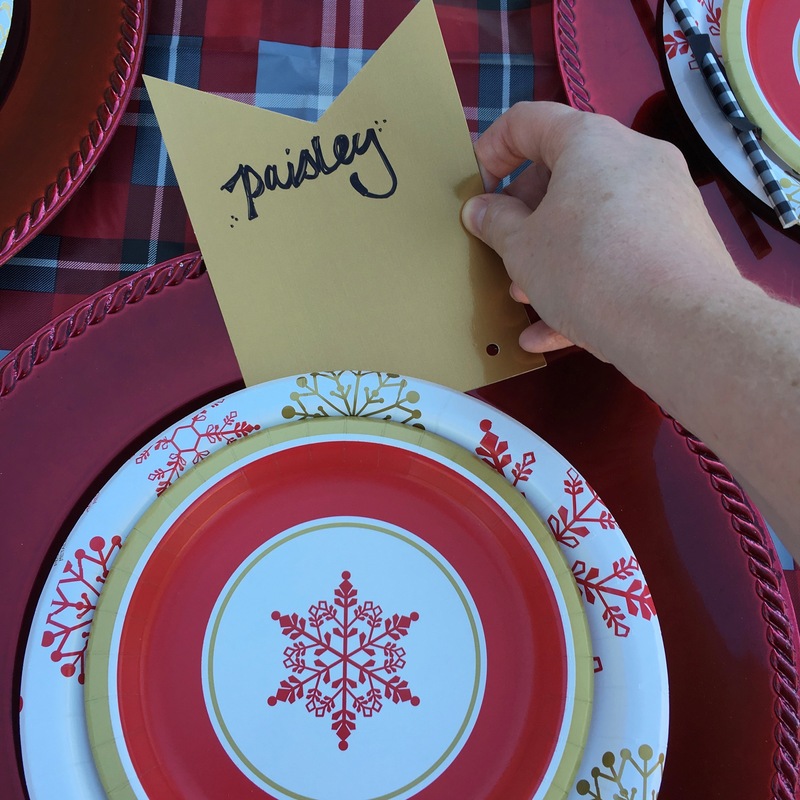 I hope these simple touches help make your Christmas-themed tablescapes not only beautiful, but a “piece of cake” to clean up!